The DC Rebirth initiative has shown a new embrace of teams and families, and it’s one of the best things about the editorial shift. Much of the New 52, and even the short-lived DC YOU, was focused on individual characters to the exclusion of any partnerships, whether they were based on justice, family or romance. Writer Steve Orlando shifted seamlessly from one to the other, first scripting brutal vigilante Midnighter’s solo book during the character’s stint as a single man, then bringing Midnighter and his former lover, Apollo, back together as a world-saving romantic duo. Orlando has a knack for layering violence and affection into a delicious story cake, so it bodes well that he’s leading flagship title JLA into a new era. Justice League of America: Rebirth #1 begins like many of the other Rebirth team books, collecting a group of seemingly unrelated characters into a collective called to save the world. The title echoes Detective Comics as Batman gathers yet another roster of heroes (and almost-heroes) without revealing the risk(s) they’ll face. As the Dark Knight assembles his new recruits, he repeats the line that people need “human heroes,” though he seems to have a broad definition of “human.” The comic implicates that the “Big Seven” Justice League is too far removed from reality—that they’re gods instead of regular people—which is a fair observation given the powers they wield. But Batman’s new team has two members who can hardly be called human at all, and all three of the female heroes are metahumans. Only Ryan Choi, who suits up as the Atom, is a human in the literal sense. But the team as assembled is interesting, both because of the individual flaws of its members and as a group. Killer Frost, partially rehabilitated from villain to gray anti-hero, joins Black Canary, the previously mentioned Atom, the Ray, Lobo and Vixen, who slings some sharp verbal barbs at Batman during a satisfying exchange. The book also marks the triumphant Rebirth return of the classic Lobo, complete with biker leather and gross habits, though Ivan Reis’ slick art leaves his hair looking a little too clean. Reis has proven that he has the house style required for a big-name DC book—most recently on David Walker’s Cyborg. Matched with excellent inkers Joe Prado and Oclair Albert and colorist Marcelo Maiolo, Reis produces a clean book that’s pleasing to the eye. No big surprises emerge in the character designs or panel layouts, and that may be the biggest issue with this debut. 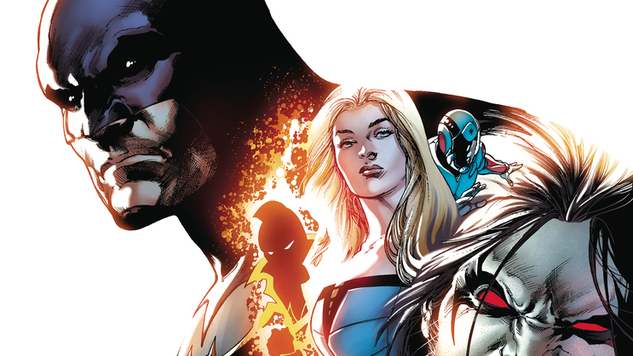 JLA is pitched as a new team for a new type of threat, a group that regular people can rely on and identify, but the art is standard—if perfectly executed—superhero fare. Taking greater risks with an artist who’s less conventional could take JLA from a strong book to an intriguing one, but the risks DC is taking with characters and stories aren’t reflected in its art choices, and it puts titles like JLA in danger of becoming stale. Similarly, Batman’s vague, portentous warnings read fine for this issue, but if they stretch out longer, they could veer on frustrating, if only because Batman’s been doing a lot of Nostradamus impressions lately. Putting out a book with decades of continuity while multiple other titles feature the same characters presents a challenge: in isolation, Justice League of America: Rebirth #1 is a strong effort with good pacing, fun dialogue and beautiful art. In the context of DC’s wider offerings, it feels familiar. Orlando has a talent for subverting expectations, so that likely won’t be the case for long.